Hello, hello! 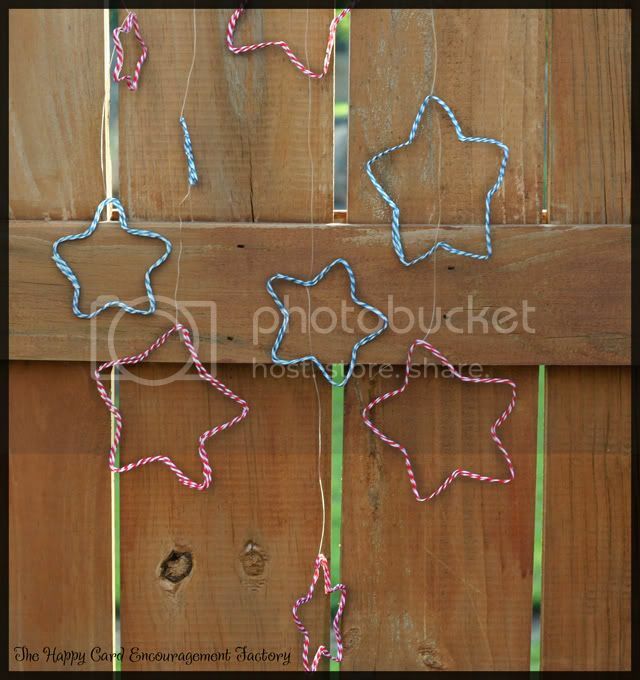 Design Team member Becki here with a cute little project that I wasn't sure would work out too well - stand alone twine stars. I know Fourth of July has come and gone this year but I couldn't get the Star Spangled Banner out of my head (probably because it's one of the only songs I can play on the piano). With that song came the idea of a rocket ship with stars trailing behind it. But since the Fourth is over, what would I use it for? Along came my 2 year old nephew who is obsessed with Buzz Lightyear. Buzz has to use a ship to go from planet to planet right? 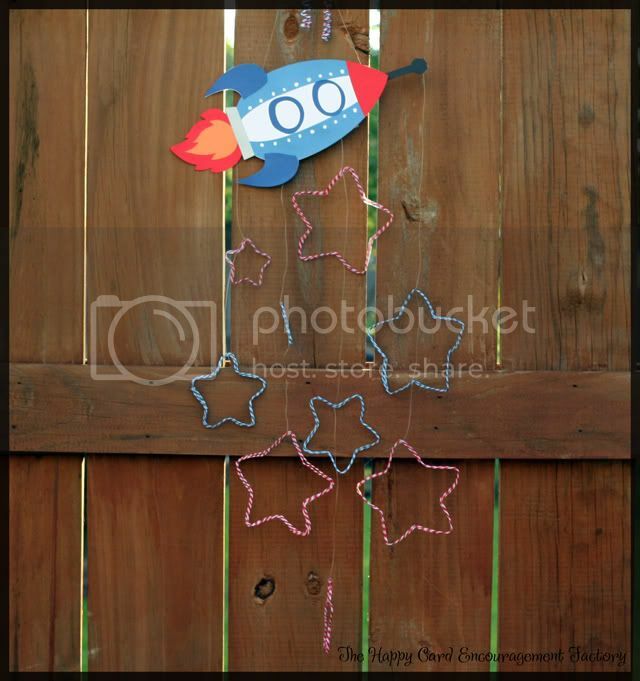 Why not make a rocket ship mobile to hang in his room? Different, huh? I thought this month's Trendy Twine color Berry was perfect but couldn't help use some Blue Berry besides to match my rocket ship. Guess I just can't get the good ol' red, white and blue colors out of my head. I already know Logan likes it because he kept trying to grab it and repeating "Buzz" over and over. This mobile is really going to look cool hanging in his Toy Story room. The stars are super easy to make. Just visit my blog, The Happy Card Encouragement Factory, for details on how to make the stars. Thanks for stopping by and have a great day! Here is my second Trendy Twine DT project this month using Berry Trendy Twine. I had such fun making all these lucious berry items with this wonderful twine. I made the card first and then went from there. I had fun with the strawberry and am sure that my father-in-law will enjoy the cherry strawberry preserves that are in this jar which I made for his birthday. Stop by my blog for more details. but wanted to share here as well. 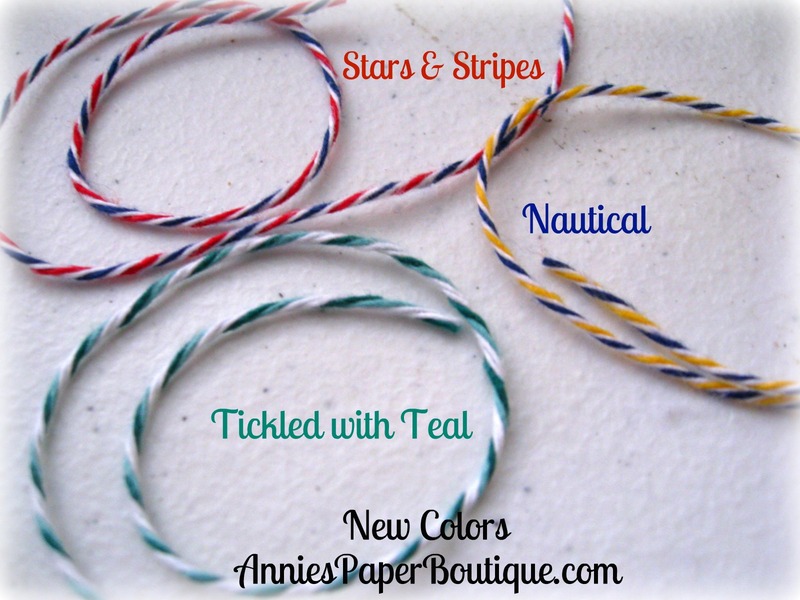 Here are the three new additions to the Trendy Twine line. I'm really loving that Nautical one. The navy and yellow look gorgeous together. Spools are available for purchase in the store, but will ship after August 8th. Remember, we do have many more colors coming this summer. Hi Trendy Twine Fans! This is Aman and I am so excited to be a guest designer for Trendy Twine today! 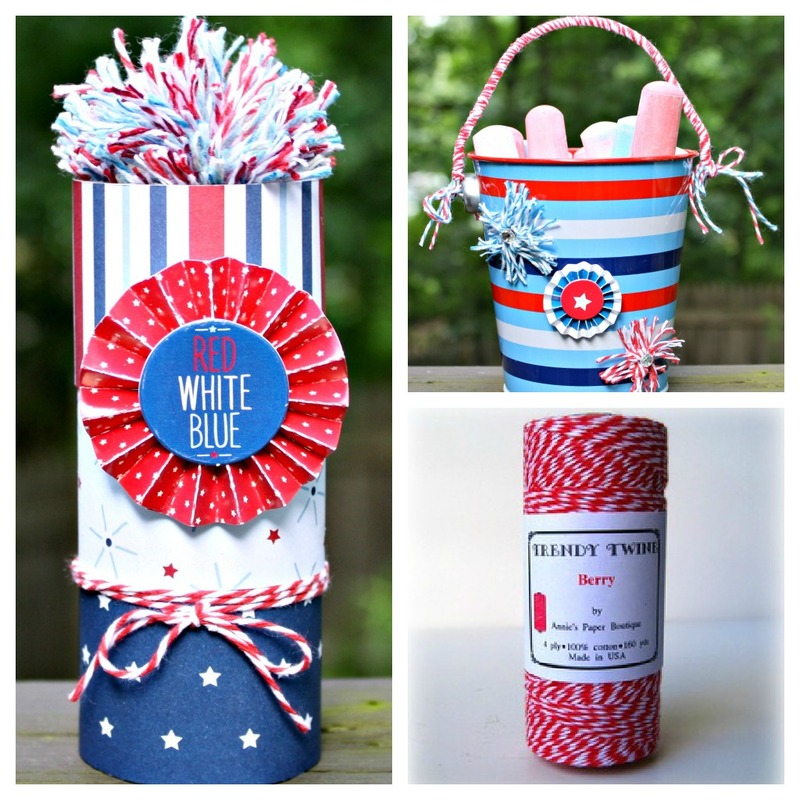 This month Trendy Twine is featuring Berry Red, which is a vibrant red and white twist. 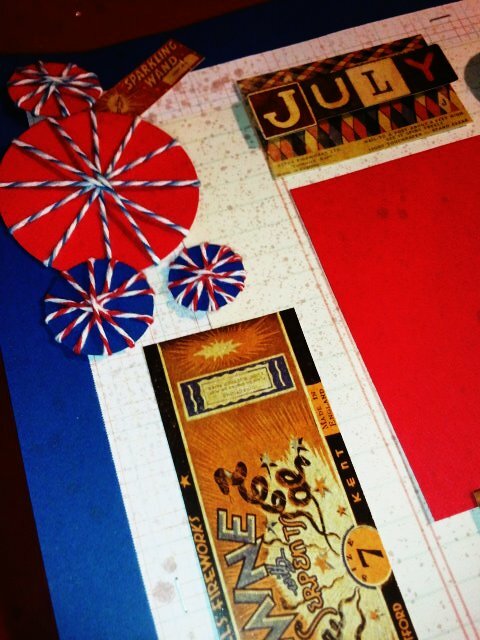 This is the perfect color for your Fourth of July or Summer projects. Berry Red also happens to be on sale this month. For my project I decided to make a two page layout. I used the Berry Red and Twisted Lime to create this watermelon. I also accented the spatula and title with a twine bow. Trendy Twine is the perfect addition to any crafty project! To find out more about my project, you can visit my blog here. Also, don't forget to enter the Trendy Twine July challenge. You can even win an extreme pack of Trendy Twine. I know I will be completing this challenge. Have a great day! Hello, Trendy Twiners! Thanks for stopping by today! Sometimes as I am creating a card/project, I stare at what I think is the final product. I stare at it thinking there is something missing. My favorite go-to product is of course TWINE! There are so many things that you can do with twine, from a simple bow to creating a detailed twine embellishment. On my card today, I thought a simple twine bow would do the trick! Thanks again for stopping by today! Don't forget to participate in our Monthly Twine Challenge! Get the details HERE! Interested in more details about this project, please stop by my blog, Kissin' Krafts! Hi Everyone! 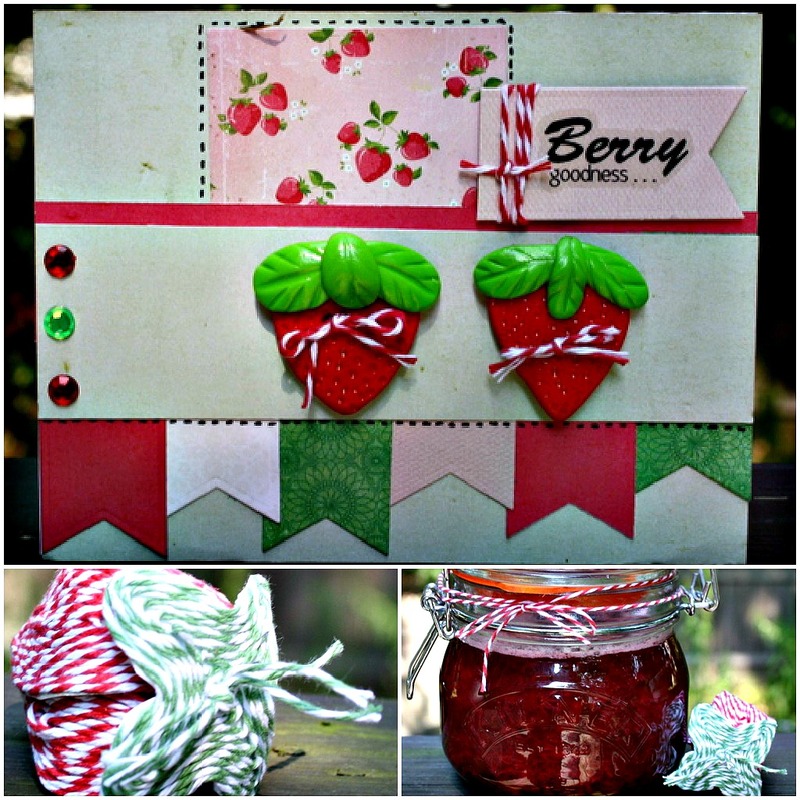 Candi here to share a fun shaped card with you today, featuring the lovely Berry Trendy Twine (which just happens to be on sale, hint hint). One of our favorite things to do over at Trendy Twine is to show you fun & creative uses of twine, not only can it add the perfect simple touch with a few strands or a bow, but you can also use it as a main component in your creations! I decided to make an encouragement card to send a friend who is considering going back to school. Since I'm going to be mailing this I opted to make my pom poms a little less full so they will still fit into an envelope easily. Feel free to visit my blog if you'd like some details. It's Jamie here to share a sweet project with you! We're featuring Berry Trendy Twine this month and I made a ring and matching box. I knit an i-cord and then wrapped it on a glue dot to make the top of the ring. Then I hot glued the top onto a ring. I finished the box off with a big Berry Twine bow and button. 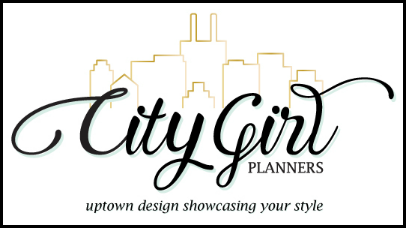 Visit my blog HERE for details on my project. 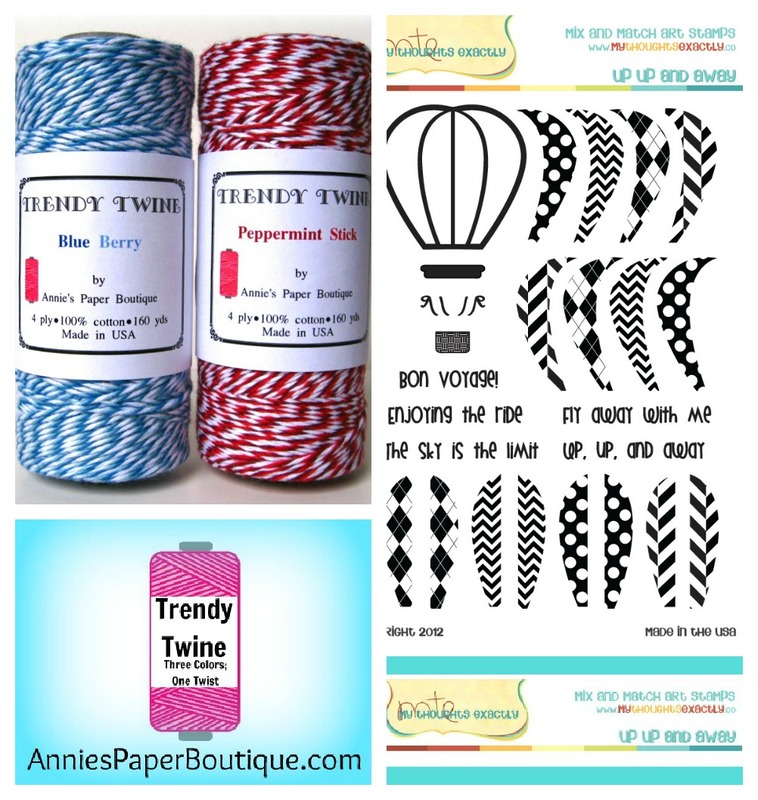 You can get our Featured Berry Trendy Twine on sale right now HERE. Don't forget we have our challenge going on right now, you can get all the details HERE. Hi, it’s Izzy Anderson here with the Trendy Twine design team. 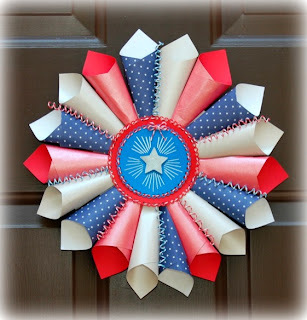 I have a fun and easy summer project: pinwheels and paper flowers. We’re using Berry Red Twine this month, which is a great versatile color to use all year long. 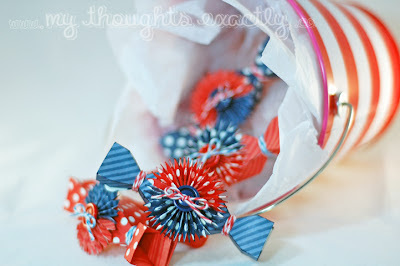 To me, pinwheels just scream summer fun and they are really easy to make. To make a pinwheel, all you need is a square of double-sided patterned paper, your favorite twine (Trendy, of course! ), glue and some sort of stick or dowel. You can find full project instructions and additional photos on my blog at Write Snap Scrap. 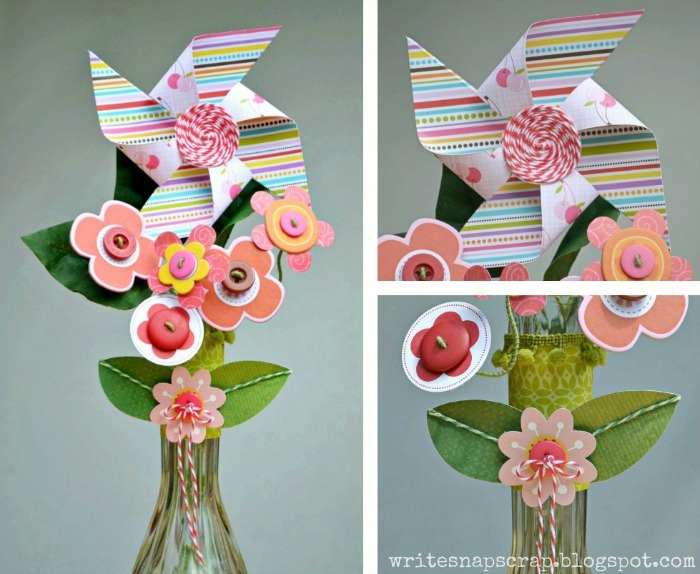 I paired the pinwheel with several flowers made from paper and chipboard for a fun and festive summer centerpiece. I used Berry Red twine in the pinwheel center and for the button bow and I used Twisted Lime for the veins of the leaves. We’d love to see what you’re making with Trendy Twine. Just jump right into our July challenge here. It’s easy to enter and fun to win! You can find all the details on the Trendy Twine blog. Thanks so much for stopping by! with This Misfit Crafter guesting for us today. using Berry and Blue Berry Trendy Twine. twine to embellish her page? and leave some love while you are there. Sunday, July 22nd. Shop now. Hello Trendy Twiners, today I am back with a simple shoe card featuring Berry Trendy Twine, which is on sale this month. For my card instead of using the paper laces, I used twine as shoe laces and finished the ends off with some scotch tape. I just love the the look of the twine laces. For complete details on my card, please stop by my blog. Also, remember there is still plenty of time to join in our July challenge to win some Trendy Twine of your own. Thanks for stopping by! I do a lot of party projects and other types of crafting but sometimes I just like making a simple card. This one made me smile when it was done. I hope you like it too! I will be back on Monday August 6th with a new creation for you so please come back and visit often. Don't forget, you have until July 28th to participate in the July Challenge featuring Berry Twine! Alyssa here from My Thoughts Exactly :D Today I have a simple card for you featuring Berry Red Trendy Twine! Seeing red - it's confession time! Okay, let me start with my first confession - I am seeing red right now!! But it's not what you might think - there is not an ounce of anger brewing over here. The truth is, I have been up to my eyeballs in Berry Red twine, and I couldn't be happier. 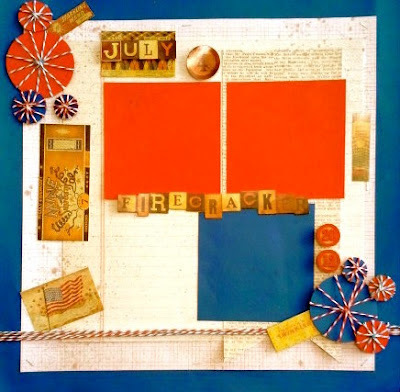 After all, (and here comes confession #2) - I am addicted to ladybugs, and this particular twine had me thinking about all sorts of ways to get "insect crafty" for my latest project! What better reason to smile! Created simply by spiraling the twine around wing shapes that I hand cut, the twine really added a fun tecture to these emebellishment! And the best part was that by using the twine cmbined with a liquid adhesive, I was actually able to mold the wings so that the bugs are acutally domes as well. So, if you are a fan of ladybugs, get your hands on some of this great twine (it's even on sale right now) and get crafty! Use it for the monthly challenge or for any crafty project, and let us see your crafty creativity! To see more details on this project (including a surprise or two with this layout), feel free to stop by my blog! Thanks for stopping by today, and have a great week! She featured Berry and Blue Berry Trendy Twine. What a sweet, fun, and absolutely gorgeous idea! 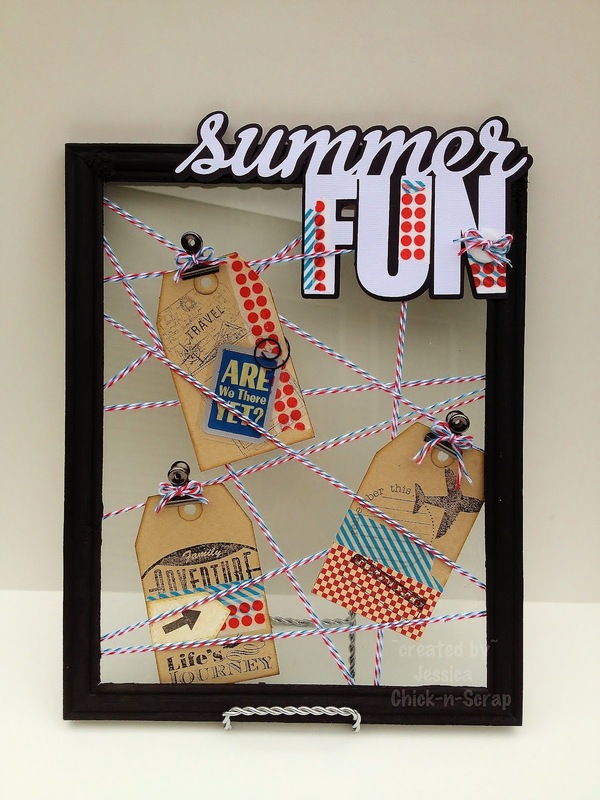 board hanging in their craft room? I think Jessica should make me one too ;) Don't you agree? These would make such a cute gift. Don't forget to link up for this month's challenge. Join us on Monday to see what awesomeness Karen has created. a little sampling of this yummy twine. Happy Friday, my Trendy Twiners! 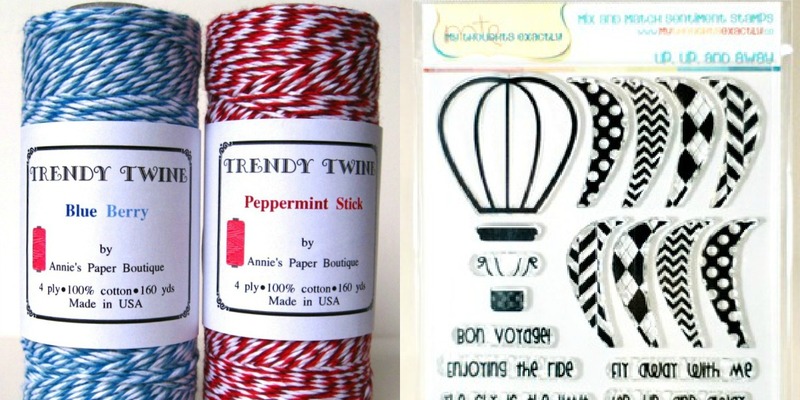 Christmas in July with Berry Red Trendy Twine! Did I scare you? It's not Christmas yet...but in less than 6 months it will be! especially love the sales that happen during this time of the year. Speaking of sales, this month the featured color is Berry Red. Drop on by and pick up some of this super yummy Twine! Check out the challenge going on also....you could win some of your very own!! 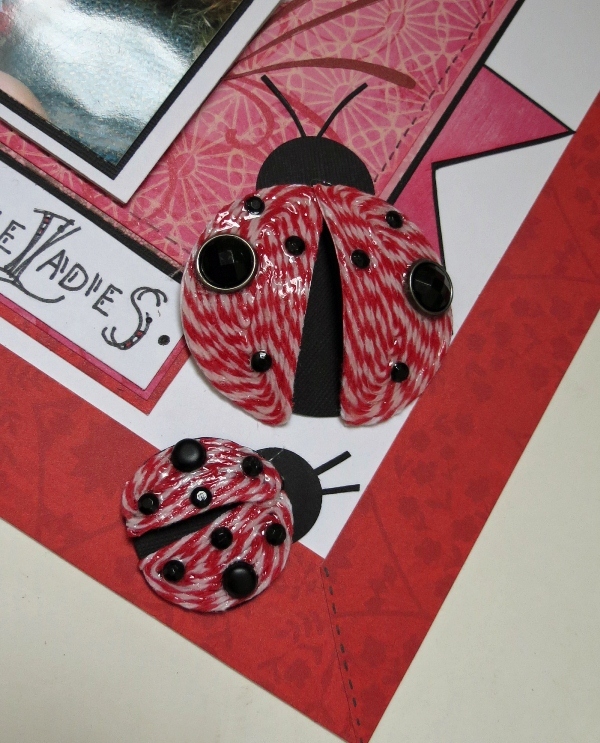 Scrapping Bug Designs to create this super cute gift card holder. the band on the hat and the tassel on the top. Drop by my blog for the recipe, AuntMargaretDesigns. Top of the ornament pulls out and the gift card slips right in. Isn't that just nifty? I know, right! Nothing says Christmas better than Berry Red Trendy Twine! Go get yours today while it is on sale. my Trendy Twine Creation with you!!! Hi Trendy Twine Fans, I am so excited to be here finally posting as a Trendy Twine Designer. This month we are featuring Berry Twine, which is on sale this month. Well I have been dying to try this technique for the longest time and I finally did. I used the Berry Twine to create my 1' lollipops. 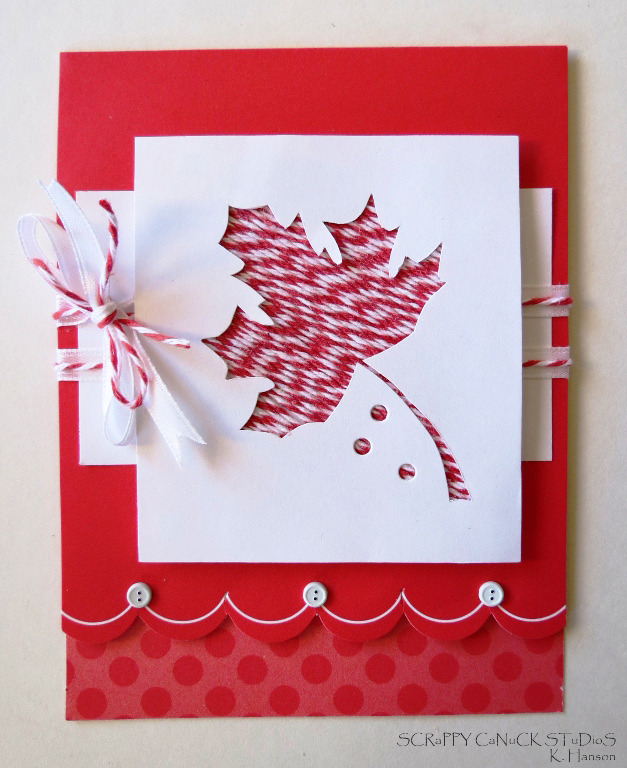 For more Details on how I created my card just visit my Blog. to win some of our Awesome Twine. Hello, Trendy Twiners! It is a fabulous Tuesday in the middle of a HOT summer. What is better than laying out by the pool with a thriller book in hand? Well, crafting with Trendy Twine of course! Voila, you have a creative masterpiece to pair with your nail-biting novel! Berry Red can be used with so many designer papers. It allows the red to POP on any project! Thank you for stopping by Trendy Twine today! Don't forget join us for our monthly challenge! Check HERE for details! There is an awesome Extreme Mini Pack up for grabs! Have a Terrific Trendy Tuesday Twiners! Hello Trendy Twine fans, today I am sharing this elegant card showcasing this month's featured twine, Berry Red. This red and white twisted twine is a great classic color for all of those crafty creations and it's on sale this month! I used the twine to accent the frame around the dress form by simply wrapping it around the scalloped edges. I created a Trendy Twine skirt by unraveling the twine and finished it off with the braided twine waist band. For more details on my project, please feel free to stop by my blog. Don't forget to play along with the July Trendy Twine challenge featuring Berry Red for a chance to win an Extreme pack of Trendy Twine. Thanks for stopping by to check out the "trendiest" twine out there, have a great day! Hello Trendy Twiners, design team member Yvonne here. 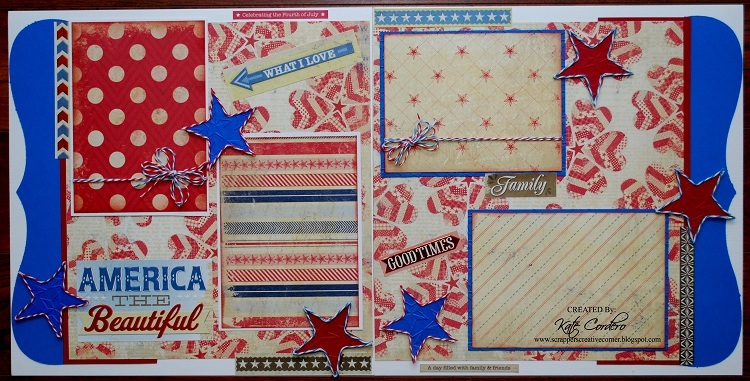 Today I'm posting a fun 2 page scrapbook layout for all those 4th of July photos you took yesterday. 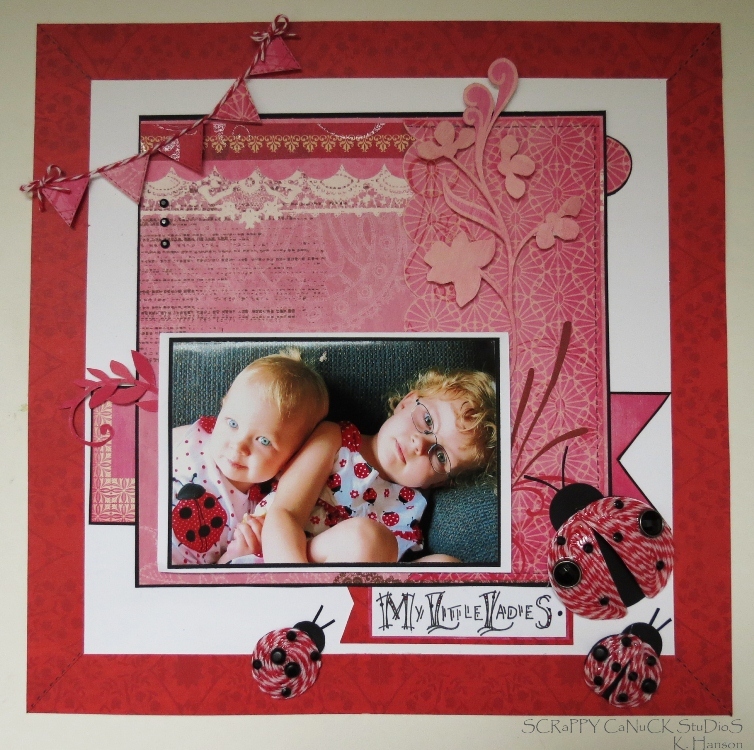 The Design team is showcasing Berry Red twine this month. I used it on my layouts as the center of the dahlia flower medallions and as accents on the embossed navy paper. Hi everyone! My name is Helen and I am so happy to be posting today as part of the new Twine It Up! with Trendy Twine Design Team!! 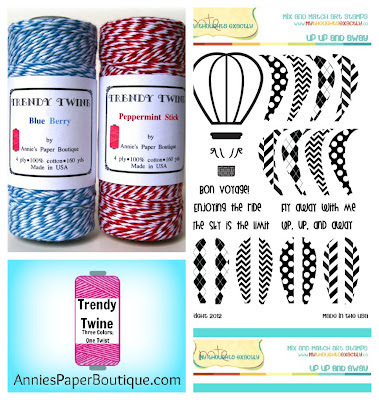 We are spotlighting the Berry Trendy Twine this month. 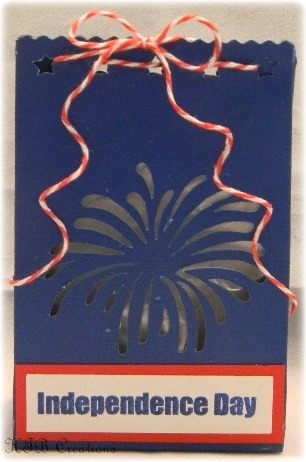 So I decided to make one last 4th of July card to show you today. You can use the same design for something other than 4th of July though. I used my Berry Twine and carefully glued it around the heart in I *heart* USA. 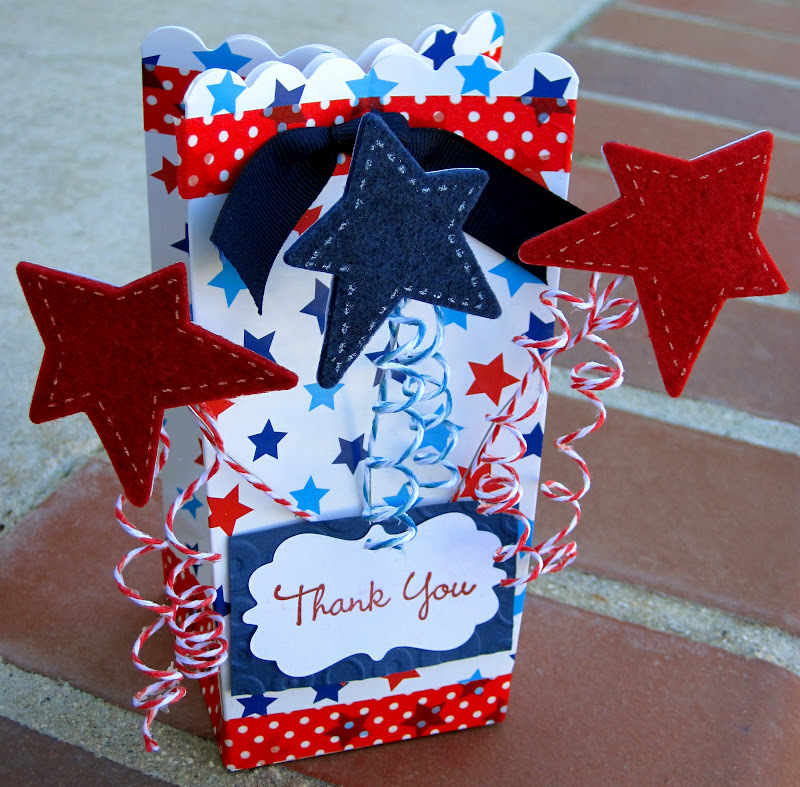 I used the Stars Cuttlebug folder for the top layer, then I wrapped it the twine several times around that. I think it turned out pretty cute! 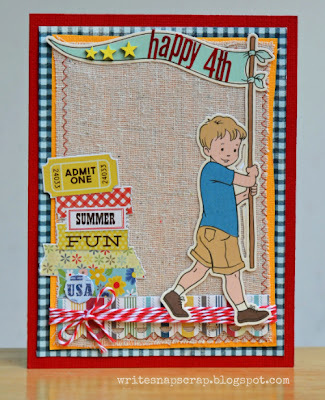 You can get the rest of the supplies used for this card at my blog. 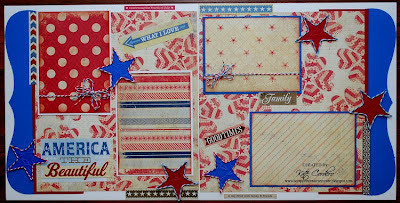 This card also fits the challenge that we have going on this month--red, white and blue and coordinating twine :) You can see the details for the challenge on this POST. Make sure to take time to play along! Have a great day and safe 4th of July!! Weren't yesterday's projects amazing? And that was only half of the design team. Today we have the rest of the team showcasing Berry Trendy Twine and the monthly challenge. So let's take a look at their amazing projects. Please visit each blog for more details. July starts a brand new challenge. and use coordinating Trendy Twine (only). use embroidery thread or hemp instead. Deadline is Saturday, July 28th. and 20 yds of Berry Trendy Twine. Also, hop over to the Trendy Twine facebook page. We have a fun little giveaway going on. and some amazing stamps. Wow! and the My Thoughts Exactly page. Deadline is 11:00 pm CST, Wednesday, July 4th. July is such an exciting month. The new Design Team starts this month and I'm so excited to work with them. It will be such a fun term. We will have two group posting days since we have expanded a bit. So the first consectutive Monday and Tuesday of each month will be set aside for the group posts. Now is a great time to purchase Berry twine. It's on sale this month. Link up at the bottom of this post! Our winner from last month was Janey from Creations by Janey. Also, hop over the the Trendy Twine facebook page. Have a twiner-rific week, peeps!